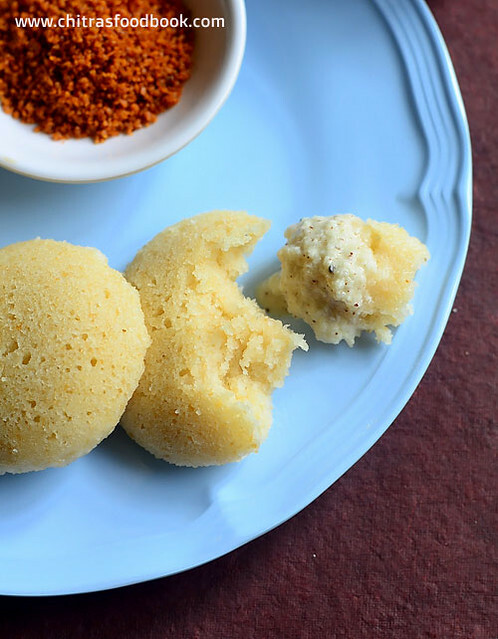 Bread idli recipe – Instant bread idli recipe with curd and rava/sooji/semolina. 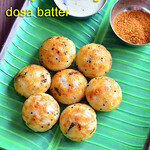 I have been eyeing on instant bread idli, bread dosa and bread uttapam recipes for long time. As I make bread recipes very rarely at home, I was waiting for the day to come. Last weekend I bought a pack of bread as I needed bread crumbs to make a snack. I had almost half the packet of leftover bread slices. So I made this easy, instant bread idli with curd and rava for our breakfast today. 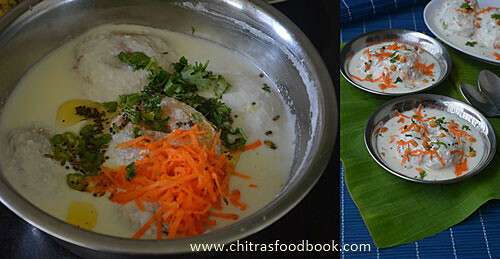 I saw Tarla Dalal’s recipe and few more using idli rava/rice rava and boiled potato. But I used our normal upma rava just like my instant poha idli and rava idli as I din’t get idli rava in my place. I did not remove the brown crust of bread as I din’t want it to go waste. So the color of my idli was yellow instead of white. You can remove the corners of bread slices to make white colored idli. Also you can replace white bread with brown bread, whole wheat bread or even multigrain bread in this recipe. 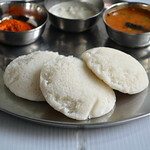 The consistency of idli batter is very important to get soft, spongy idli. It should be like our rava idli batter. It shouldn’t be too thick or thin but pourable. You can also temper this idli with mustard, chillies, ginger or add vegetables to make it more flavorful and healthy. You can play around with variations. 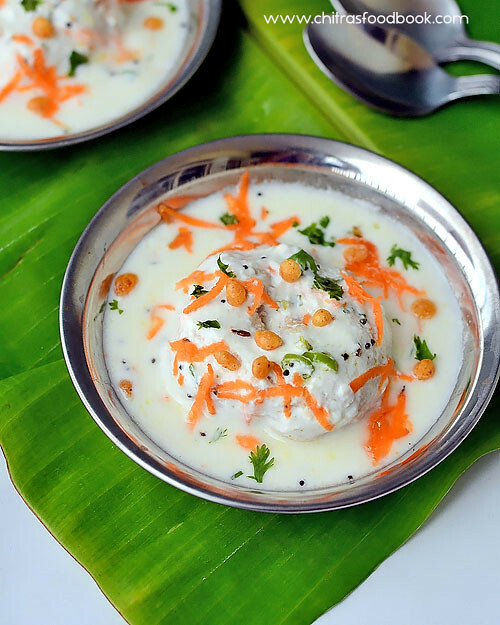 This idli can be prepared instantly without any resting time or fermentation time. Basically I am a big fan of idli varieties. 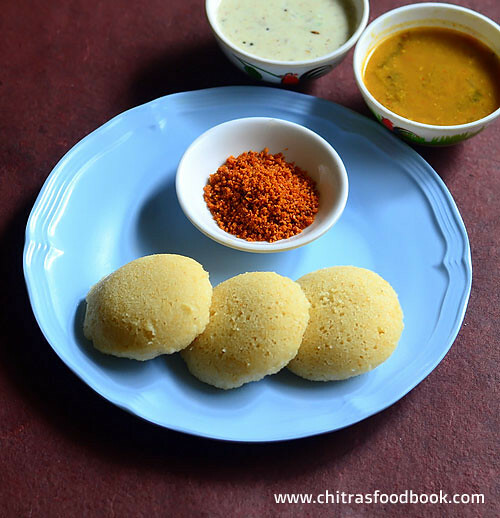 When I made this idli with my own combinations, I was very happy with the output and glad I could add this bread idli recipe in my Idli varieties collection. This idli has to be served hot to enjoy its best taste. The best side dish for this idli would be a spicy coconut chutney or tomato chutney Or you can even serve it with easy tomato onion thokku. I am planning to make instant bread dosa and bread uthappam too. I will share them one by one. 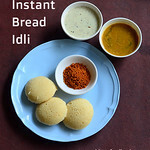 Ok, now lets see how to make bread idli at home instantly with step by step pictures and video ! 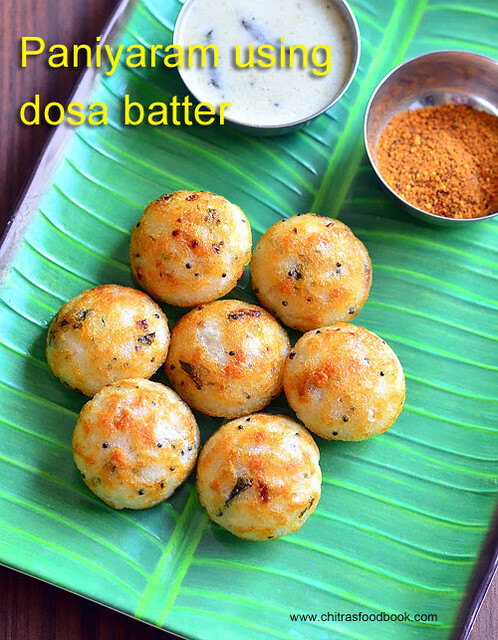 Check out my Instant Poha idli, Instant rava idli and 15 Idli varieties collection too. 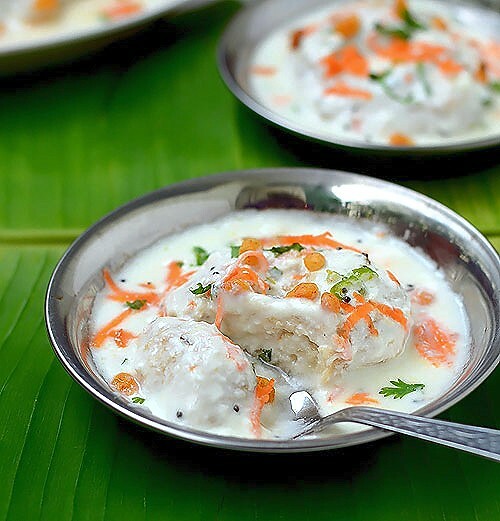 Easy, instant bread idli recipe with curd, rava using leftover bread slices. Take bread slices and tear into pieces. Grind to fine powder.Collect in a bowl. Dry roast rava for 3-4 minutes. Let it cool down. Mix with powdered bread. Add curd, salt and mix well. Add water gradually and make thick batter. Add baking soda at the end. Mix well and rest for 5 minutes. Grease idli plate and pour batter till half of the mould. Steam for 10 minutes. Idli becomes big in size and spongy. Remove after 2 minutes. 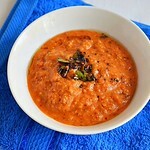 Serve hot for best taste with coconut chutney or tomato chutney as side dish. Take bread slices and trim the sides if you wish. I din’t remove the corners of bread. Tear into small pieces and grind to fine powder. I got 1.5 cups of powdered bread. Collect in a bowl. Dry roast rava for 3 to 4 minutes. Let it cool down completely. Add to the powdered bread. Add curd, salt and mix well. Add water gradually and make a thick but pourable idli batter consistency.Please refer video. The quantity of water may vary if you remove the crust of the bread. Water quantity also varies based on the freshness of bread. If you make the batter too thin, idli becomes flat.If the batter is too thick, idli cracks and looks very big. Add baking soda, mix well and rest the batter for 5 minutes. 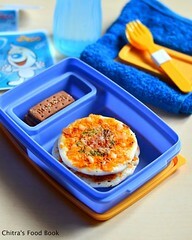 In the mean time, take an idli plate and grease molds with oil. Mix & Pour the batter till 1/2 or 3/4th of the mould. This idli becomes bigger in size after its cooked. So its better to fill less batter in the mould. Roll boil water in an idli pot. Place the idli plate and steam it for 10 minutes. Remove the idli after 2 minutes. Serve hot with coconut chutney or tomato chutney for best taste ! Roasting the rava is an important step.Do not add unroasted rava. You can also use idli rava/rice rava in place of semolina but you should rest the batter for 20 minutes for the idli rava to soak well in curd. Add water gradually while making the batter. Its consistency should be thick and pourable. If the batter is watery, idli comes out flat. If the batter is too thick, idli becomes very big and crack on the top. For healthy options, you can add grated carrot and cooked peas in the batter. You can also temper the batter with mustard seeds, urad, chana dal, finely chopped green chillies, ginger, curry leaves and coriander leaves. 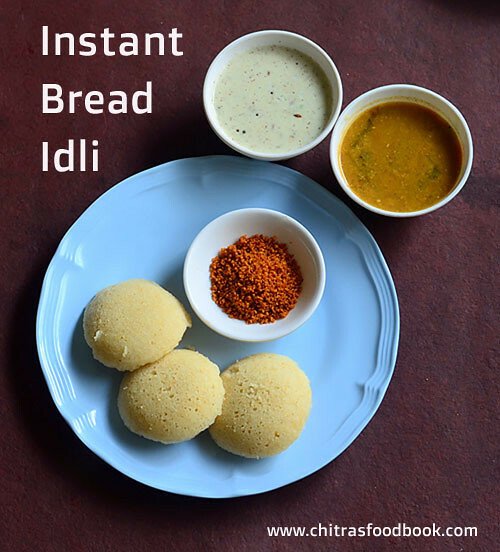 Try this easy, instant bread idli for your breakfast or dinner. 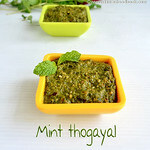 Enjoy with your favorite chutney or tomato thokku ! Paniyaram recipe with leftover idli, dosa batter is my most favorite South Indian breakfast and dinner recipes. I can have it 24x7. My mom calls it as idli dosa maavu paniyaram. In Tamil nadu, people make kuzhi paniyaram at least once in a week. Not only in Tamil nadu, this paniyaram recipe is very popular in Karnataka and Andhra as well. In Kannada, it is called as Paddu or Guliyappa. In Telugu, it is Gunta ponganalu. 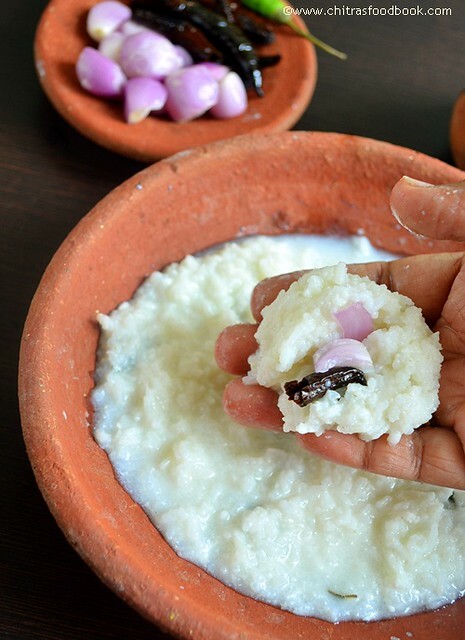 In Kerala, it is kuzhi appam in malayalam. There may be slight variations in the paniyaram batter recipe but the taste and preparation is almost the same. Generally people say kara chutney ie. Red chutney is the best side dish for paniyaram but I love my mom’s watery coconut-fried gram dal chutney( Pottukadalai chutney) that tastes like road side hotel chutney. You can find the same in the pictures. Before marriage, my mom reserves some leftover sour dosa batter and make ghee paniyaram especially for me. 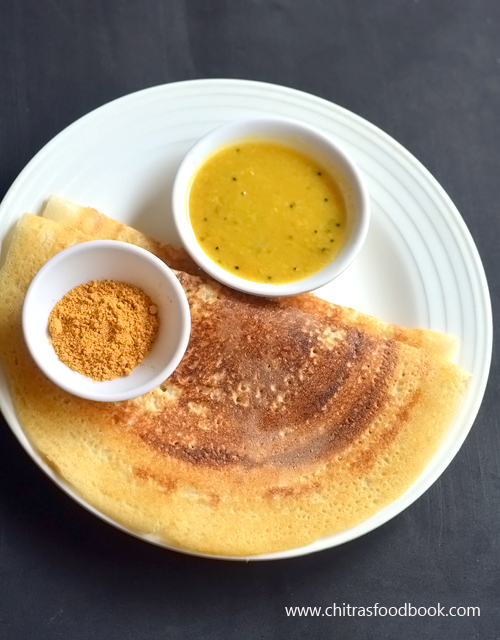 Yes, Kuzhi paniyaram tastes the best when prepared with sour dosa batter more than fresh idli,dosa batter. It would be crispy outside and soft inside. The flavor of ghee and smell of sour batter takes this dish to next level. Sometimes my mom adds a pinch of cooking soda if the batter is too sour. I love to have this paniyaram as evening snack too. So my amma makes it after I come from college. After marriage, I follow my mom and make ghee paniyaram for Raksha and rarely for myself and Sendhil . Long back, I made a post on Paniyaram varieties in which I had shared my MIL’s style sweet paniyaram, Kara paniyaram and masala paniyaram recipes. At that time, many readers asked me whether it can be prepared without paniyaram pan. I don’t think so. Deep frying in oil is the only alternative. But the shape and texture will change. Moreover it absorbs more oil and make the dish high in calories. If you want to taste this delicious paniyaram in a healthy way with low calorie, you need to buy a non-stick paniyaram pan. 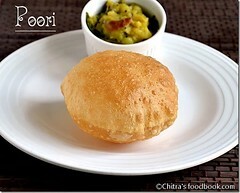 Just a few drops of oil or ghee would be enough to make this yummy delicacy. In South India, you can find this pan commonly in all the vessel shops. If you are in abroad, you can buy it online as well. 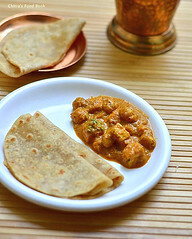 Ok, lets see how to make this most popular Paniyaram recipe with step by step photo. 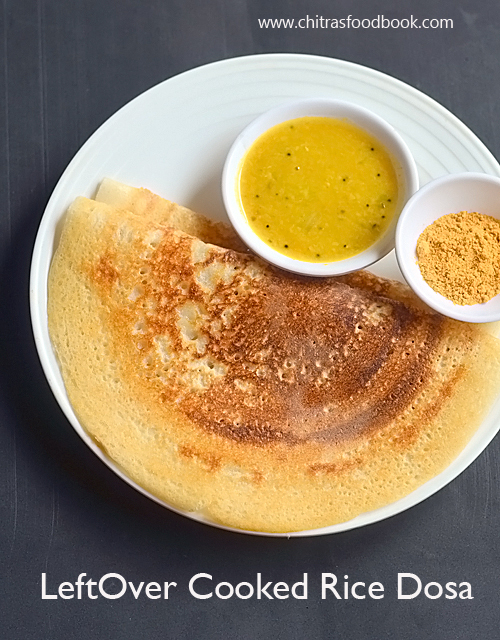 Take the dosa batter in a bowl. Add little water if its too thick. Temper mustard seeds, urad, chana dal, hing. Saute onion, green chilli, curry leaves and coriander leaves. Add to the batter. Check for salt. Heat paniyaram pan with 1 tsp oil in each hole. Pour the batter.Cover the pan.Cook both sides and remove. 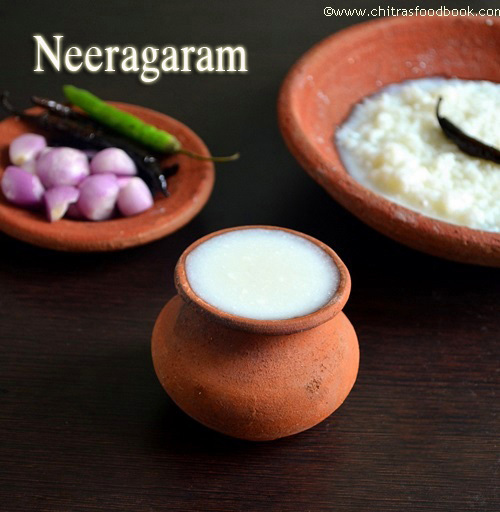 Enjoy with coconut chutney or kara chutney ! Take the leftover dosa batter in a wide bowl.Add little water, say 1/4 cup if the batter is too thick. Heat oil in a kadai.Temper mustard, urad dal, chana dal and hing. After dals turn golden, saute the finely chopped onion, green chilli, ginger, curry leaves, coriander leaves and little salt. Saute till onion becomes transparent. Add to the dosa batter.Mix well. Paniyaram batter is ready.Check for taste, add salt only if needed. If the batter is too sour, you can add a pinch of cooking soda. Mix well and rest the batter for 10 minutes. Heat paniyaram pan adding 1 tsp oil or ghee in each hole. Pour the batter and keep the flame medium high.Cover the pan and cook for sometime. Use a stick like pointed tool or spoon to flip the paniyaram. Cook the other side. Remove in a plate. Serve with your favorite chutney ! To make it more healthy, you can add grated carrot, cooked peas to the paniyaram batter. You can add finely chopped chilli to make the paniyaram taste spicy. Adjust the flame from medium to high to cook the paniyaram with golden tint on top as shown in the picture. Adding coriander leaves is optional but it adds a nice flavor. 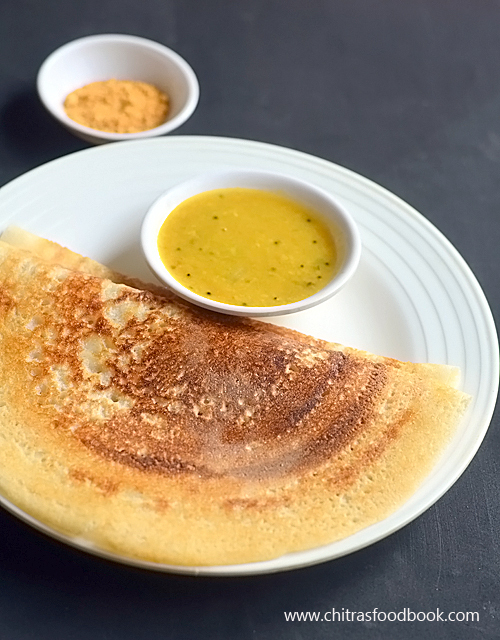 Try this easy, yummy Kuzhi paniyaram recipe with leftover dosa batter. 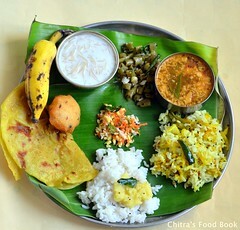 Enjoy with pottukadalai chutney as I did. 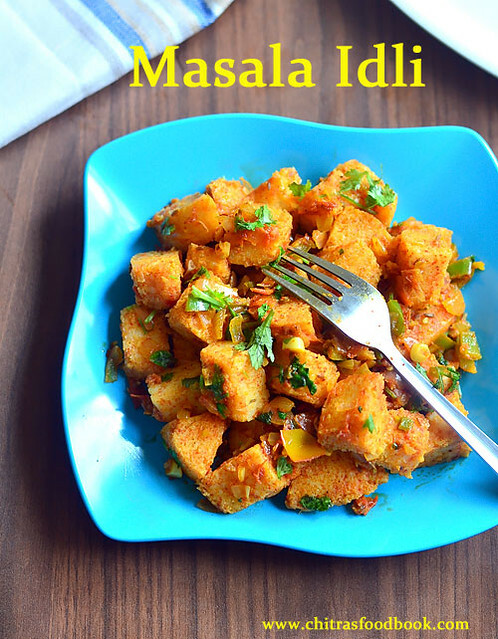 Masala idli fry is an easy, kids friendly recipe that can be made using leftover idli.We can prepare this idli fry with fresh mini idli too. It can be served as breakfast, dinner or as an evening snack for kids. 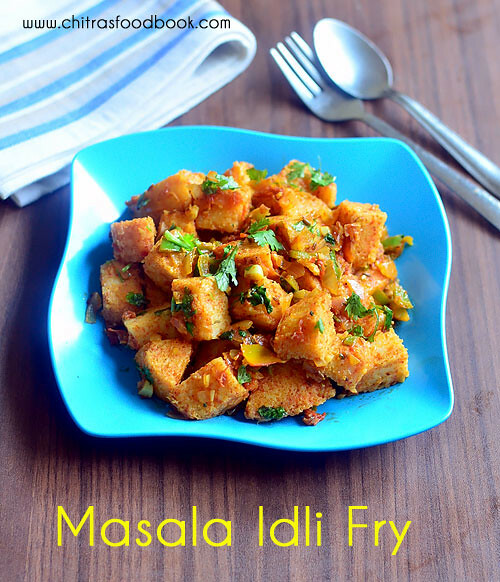 Usually I make South Indian, Tamilnadu style masala idli fry. This time I prepared it in North Indian style adding Pav bhaji masala powder.Actually speaking, recipe of masala idli varies from place to place.It can also be prepared in a simple way adding garam masala powder or fennel powder. As this is my first attempt in North Indian style, I followed this recipe from Spice up the curry & Red Chilly and tried for our breakfast. I adjusted the spice level as per my family’s taste. It came out really well. Sendhil & myself loved it a lot. I hope Raksha will like it too. If making for kids, you can try the same with deep fried idli pieces. 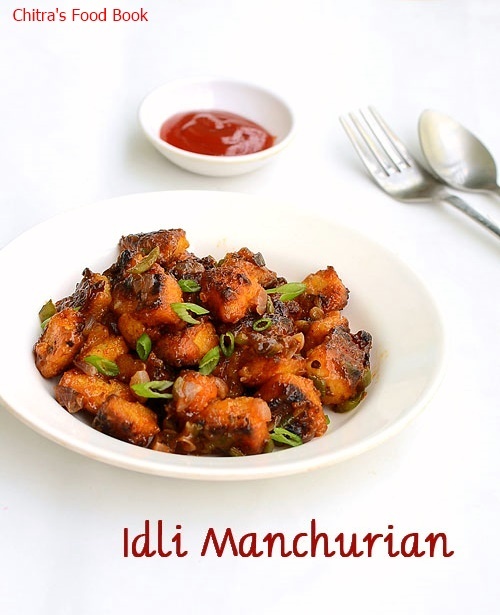 This recipe is a great way to use the leftover idli. You can also add vegetables like finely chopped carrot, cooked peas along with capsicum to make this dish more healthy and colorful ! 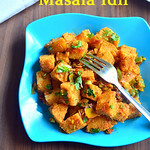 Now lets see how to make Indian style masala idli at home using leftover idli with step by step photos & video. Do check out my other leftover idli recipes like Chilli Idi, Idli manchurian, South Indian style masala idli, Pepper idli and Idli upma recipe. Chop the leftover idli into big cubes. Heat oil in a kadai. Temper cumin seeds. Saute onion, ginger, garlic and tomato. Add all the spice powders, salt and mix well. Add 1/4 cup of water to the masala and boil for a minute. Lastly add the idli cubes, mix gently to coat the masala. Garnish with coriander leaves. Sprinkle ghee & lemon juice if needed.Serve hot ! 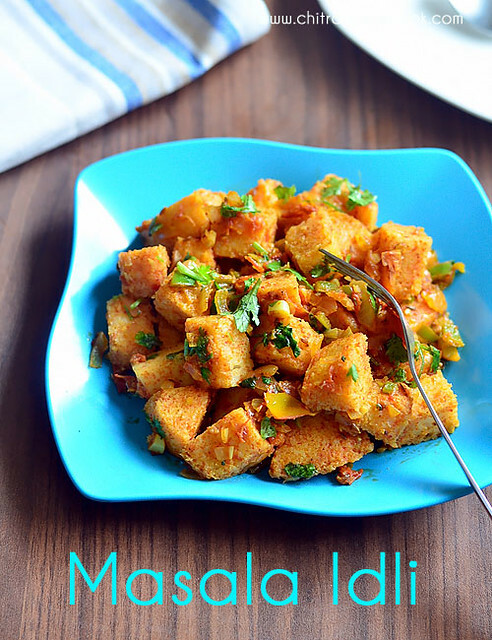 Take the leftover idli and chop into big cubes. You can chop each idli into 8 or 9 pieces.Set aside. Heat oil in a kadai. Splutter cumin seeds. Saute onion, capsicum, garlic and ginger pieces. After onion becomes transparent,add tomato and saute for a minute. Add turmeric powder, red chilli powder, pav bhaji masala powder, sugar and mix well. Saute till tomato becomes mushy. Add 1/4 cup of water and boil for 2 minutes till masala becomes semi dry. Lastly add the idli cubes, mix gently without breaking.Coat the idli with masala. If masala has more water content, idli will break. So make sure masala is almost dry. Mix idli & cook for a minute.Switch off the flame. Garnish with chopped coriander leaves, few tsp of ghee and sprinkle some lemon juice. Mix well and serve hot! Mash few banana pieces and cook for 2 minutes in low flame. Switch off the flame, sprinkle lemon juice and garnish with coriander leaves if desired.I did not add it.Remove and serve with rice. Adjust the quantity of pav bhaji masala powder as per your spice level. Make sure the tomato masala mixture is semi dry before adding idli pieces. I am a big big fan of Tamil nadu style thayir vadai. I love it more than sambar vadai & rasa vadai. My FIL used to buy thayir vadai/Curd vada ( Perugu vada in Telugu) from hotel Saravana bhavan and Guptha sweets whenever we visit Salem. On Tamil new year day, I made no onion urad dal Vada/Ulundhu vadai for Pooja.Then I prepared this Thairu vadai using the leftover vada. It came out very well. I served it by garnishing with grated carrot & kara boondhi just like the way served in restaurants. We loved it very much . 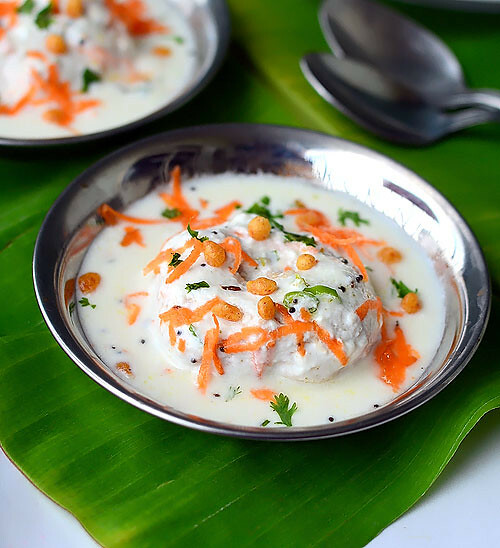 Long back I have shared my daughter’s favorite North Indian Dahi vada recipe. 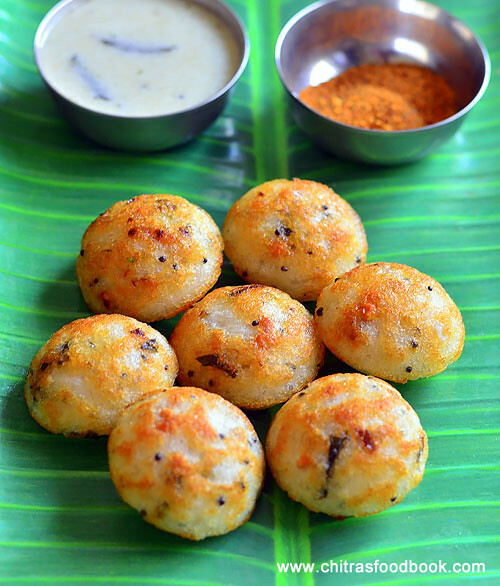 And now I am happy to share my most favorite South Indian Thayir vadai recipe with you all. Try it during this Summer Vacation and enjoy with your family. 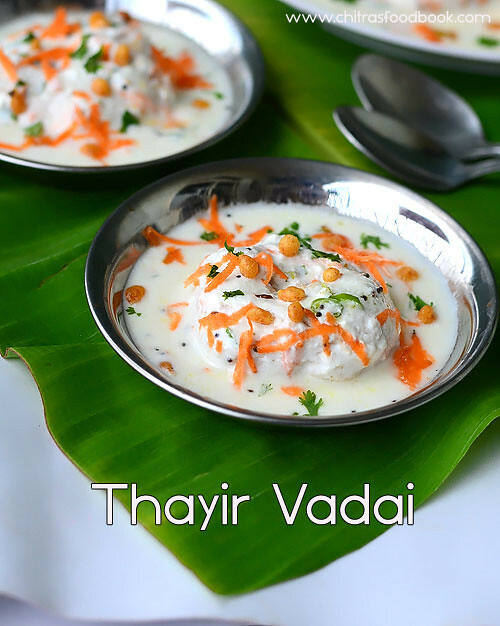 Lets see how to make South Indian Thayir vadai/Curd Vada Recipe. Wash and soak the urad dal for an hour or two. Drain the excess water completely. In a big mixie jar, grind green chillies, ginger and hing without adding water. Add the drained urad dal and grind it without water. 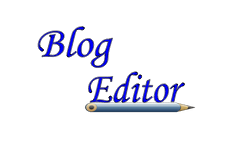 It would grind coarsely.Wipe the sides of mixie jar. Now add 2 tbsp of water.Grind again. Add water in only a tsp or tbsp at regular intervals and grind a smooth & soft batter. Batter should not be watery or too thick. It should be airy & weightless. So add less water and grind the batter patiently. You can use ice cold water too. Do not add salt while grinding the batter. Remove the batter and check its consistency. For this,drop a pinch of batter in a bowl of water. If it floats on top, batter is just right. Remove the creamy batter in a bowl. Beat it well using your hands or an egg beater to make the batter airy( Updated tip from Sujata).Add finely chopped curry leaves, Pepper powder if you wish and required salt if you are going to make vada immediately. Else keep the batter in the refrigerator till use without adding salt. Heat oil to deep fry and check its temperature by dropping a pinch of batter. If it rises immediately, oil temperature is right. Simmer the flame and drop the vada into the oil.Fry in batches,3-4 at a time in medium flame. Remove in a tissue once it turns golden on both the sides. Make 5 vada and keep it ready. Check out my Medhu vada recipe using MIXIE for more details ! Take 1 cup of thick curd in a wide bowl. Add 2 tbsp of water or little more and whisk it. Add salt and check for taste.Make sure curd is not too thick or too watery. Now boil water in a wide bowl till it starts to bubble. Drop the vada in the water. Let it be inside hot water for just a minute. Then remove the vada and put it in the curd mixture. Let the vada soak in curd mixture for 30 minutes to 4 hours. Make sure vada is well immersed in curd mixture.Temper mustard seeds, urad dal, hing, curry leaves, cashews and add to the curd. You can also add a finely chopped green chilli and add while tempering. Just before serving, add finely chopped coriander leaves, grated carrot and Kara boondhi. Serve immediately and enjoy !! 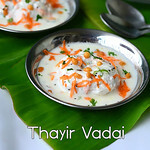 Yummy Tamil nadu style thayir vadai is ready !! Enjoy ! Grinding vada batter properly is more important. If the vada turns out hard, it won’t absorb the curd mixture properly.In that case, you can dip the vada in hot water for 30 minutes before putting in curd mixture. 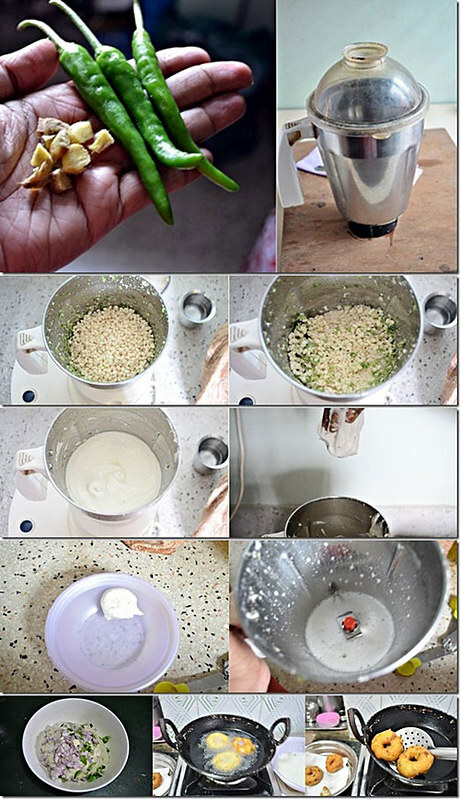 For variations, you can grind green chillies+ginger to a paste and mix with curd instead of grinding with urad dal. But add less green chillies ( 1 or 2) because curd mixture will become too spicy. Dipping in hot water helps the vada to become soft and absorb the curd mixture. If the curd is too thick, vada won't absorb it.So add little water & whisk it & dilute before you drop the vada. Don’t worry even if the vada is too cold or at room temperature. Dipping in hot water makes it warm and helps to absorb the curd.So you can make thayir vadai with leftover vadai easily as I did. Do not forget to garnish with coriander leaves, grated carrot and kara boondhi. 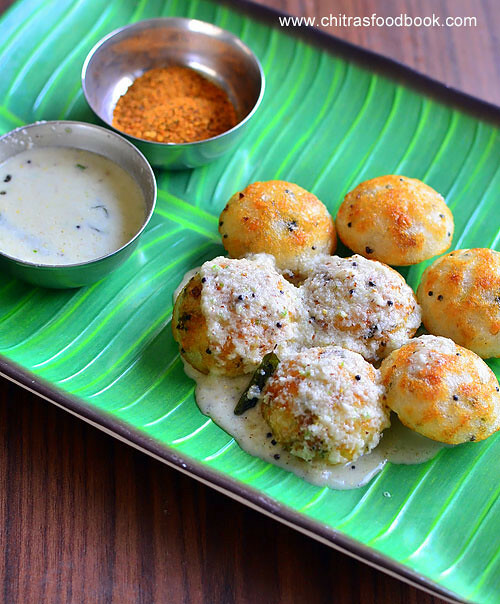 Enjoy this yummy, creamy, spongy, juicy thayir vadai !! Tastes absolutely yum !! 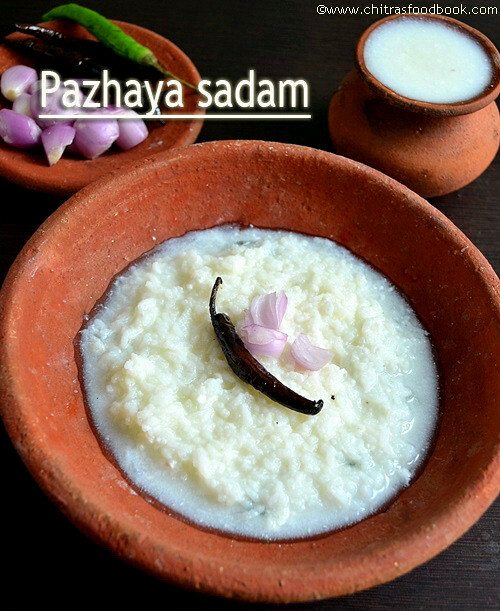 When i was thinking to post a traditional,healthy and easy coolant recipe for summer,pazhayathu aka pazhaya sadam with neeragarm recipe striked my mind.All u need is just a cup of leftover rice to make this healthy dish.I am a big fan of this recipe.My MIL makes it super tasty and flavourful adding curry leaves,small onions,more milagai,pickle and vathakuzhambu.This combination made me taste this.Before marriage,my mom had tried several times to make me eat but i never touched it and scolded my mom like anything.But after knowing its health benefits & taste,now i feel very bad about my behaviour towards my mom .My mom used to tell me when she was pregnant,she used to drink a big sombu full of neeragam for breakfast and told this is the best coolant to supress body heat compared to buttermilk and tender coconut.Yes,i agree.As soon as u drink this,u feel ur tummy chilled and keeps u cool the whole day.Usually farmers and ladies who work in field used to have this for breakfast to keep them active and energetic to work under the sun.I heard neeragaram has vitamin b12 which is not found in fruits and vegetables.So lets make use of this simple and effective body coolant for this summer.Do try it friends ..
Pazhaya sadam & Neeragaram recipe for summer ! Take the leftover rice in a bowl.I kept in the cooker itself.Add sufficient water to immerse the rice.Add few pinched curry leaves and 2 tbsp of curd.Mix well,crush the rice and keep it closed over night. The next morning,before breakfast,take the cooker,add the required curd or thick buttermilk,salt and mix it well..Strain the water and drink separately. 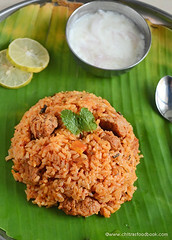 Enjoy the rice with mor milagai or green chillies and small onions. 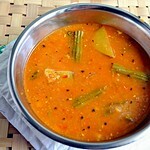 My MIL mixes pickle,raw mango pieces and left over sambar or vathakuzhambu.It enhances the taste very well. During summer season ,we add raw mango pieces while eating the rice.It gives a nice tangy taste. Adding curry leaves and little curd gives a nice flavour.But add little curd.Too much curd spoils the rice. Tastes yummy with small onions and chillies !